Ask anybody, the Real Estate industry is hard work but HIGH reward. And boy is it COMPETITIVE! Many Real Estate agencies spend big dollars on advertising campaigns, advertising screams at the prospective customer through the pages of the local newspaper, on the television, placards and billboards seem to grow by the minute have you ever noticed? Impressive right?!! Those companies must be really successful and have their marketing strategy locked in with impressive ROI’s, right?!! If you are just starting out on your own, work in a medium-sized agency or even (just to be fair) if you work for a larger well-established agency, I guarantee you are losing money with misdirected marketing. Where are you missing out you ask? That’s where the people are at! That’s where the buyers, sellers, renters, investors and tradespeople are. Online is where the majority of people spend their time, in fact, the average adults spends 5.9 hours per DAY online! So, what’s the best way to generate leads online? Read on my friends and grab these long hanging real estate fruit! SHOWCASE SOLD SUCCESSES:It’s true you can profit off a house more than just once! When you sell a property in a specific area it’s a great opportunity to gain awareness of your company and test the market interest for buyers, sellers, renters etc. Simply run an ad targeted by the zip or postal code for that property and watch the customers roll in. Area targeted ads subconsciously prepare people to contact you first for their next property move or even just for information. This is hands down one of the best ways to generate real estate leads online! GET A LIFESTYLE NICHE!One of the best ways to get real estate leads online is to use the power of Google. Set up a Google My Business Page (Google Maps) and choose a niche, stand out from the crowd. Well, most Real Estate agencies pin themselves for a geographical area, simply select a niche outside this (one that reflects your business focus of course!) to generate real estate leads online. For instance, young professional couples, pet owners, LGBTQI etc and ensure your Google reviews are from that demographic and build a part of your website to highlight your expertise in the chosen niche area. KEEP IT LIVE:People love to be able to see what is happening in Real-time, next time you hold an open house, video it with Facebook Live. Facebook algorithms prefer video content and will broadcast it to your whole network, enabling you to answer questions in real time, increasing your lead generation. To really maximize this tip to get real estate leads online, you can run the video as paid Facebook Ad targeted to that local area (say within a 25km radius of that property) for a few weeks after the open house. KEEP IT LIVE 2.0 – VIRTUAL WALKTHROUGH:Be Different! Do I need to shout that out?!! Nearly 99% of real estate ads are purely photos and written copy. So, if you’re going to stand out from the crowd, you’re going to have to do things differently and do things better. Because property investors and homeowners will inspect the house before buying it, the more transparent and thorough you can be, the better. Try inviting prospective buyers into the property from the comfort of their own home and from there, they will work out whether they want to inspect the property. Start using this strategy and you’re likely to find it is one of the best ways to get real estate leads online. For every 1,000 views, you might get a 1% conversion rate which equates to 10 home inspections. With a video walkthrough, you can bump that up to 2%, which would double the inspections and could result in a higher selling price for the property. KEEP IT LIVE 3.0- NEIGHBOURHOOD PROFILE:To really double down (or triple down) on one of the best ways to get real estate leads online, you should target you video audience even more. How? Easy as create a social media account to host area specific or niche specific virtual tours. For instance, start a YouTube channel for “Red Hill Home Tours”, host only that suburbs videos and link out to your specific landing pages from that site. Only those who want to buy a house or live in Red Hill will be searching for that so half your selling battle is done! CREATE FREE VALUE TO GENERATE LEADS:Another great way to generate real estate leads online is by creating highly valuable free resources that your target clients would be interested in downloading in exchange for their email address. For example, you might put together a PDF report entitled “Buying A House-What You Need to Know,” or “Horror House Buys (And How to Avoid Them).” The bottom line is that this free resource will give massive value to your target clients and address the pain points they are facing. The best place to start is a checklist of things homebuyers should be aware of before looking for a new house or expert tips for first-time homebuyers. You can make this content yourself or hire someone else to write it — but be sure to only include a teaser on your website. This will be enough to entice the user to download the full piece of content, which will be unlocked upon them providing their contact information. Now they have a great piece of helpful content and you have a qualified lead, so it is really one of the best ways to get real estate leads online! POWER PRO TIP: SKIM THE COMPETITION WITH GOOGLE ADWORDS!This is a powerhouse tip and one of the best ways to get real estate leads online, simply by using the influence and audience of the competition! Realtors, especially beginners in the industry with a small marketing budget and in a highly competitive location can get high quality leads at a very low cost by using Google AdWords’ to bid on their biggest competitor’s names, instead of the usual high cost per click (CPC) real estate keywords. To use this strategy, try to identify the top realtors in your area who are using massive amounts of marketing (both on and offline). These should be individuals and agencies who are frequently googled online, the big names. You can take advantage of that popularity simply by bidding on his or her name as a keyword. Obviously, you will need to be respectful how you use this strategy but it is a very common business strategy, just make sure your ad’s focus on how you can best meet the needs of your target audience. So, it’s really not that hard, is it?! 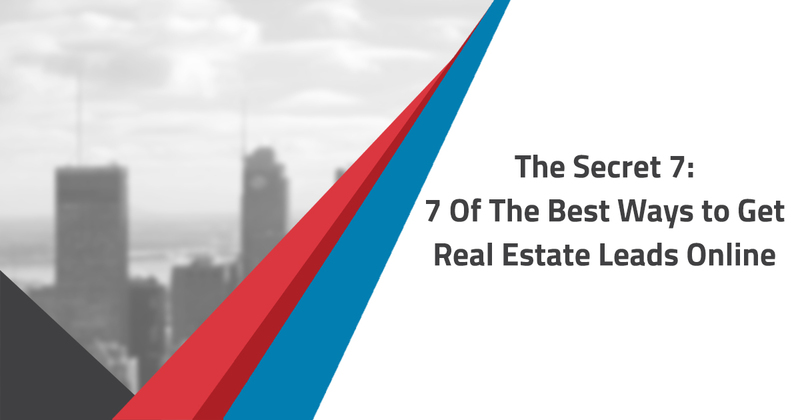 These are some of the best ways to get real estate leads online and certainly will transform your business if you implement them consistently and creatively across your marketing platforms. Now, go get that low hanging fruit and start to generate more real estate leads online today!